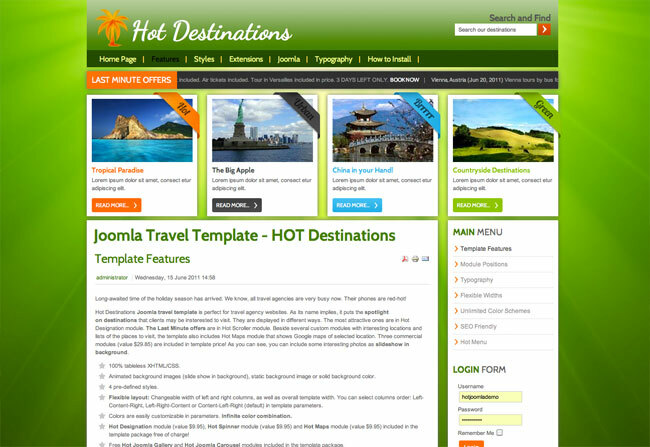 Hot Destinations Joomla travel template is perfect for travel agency websites. As its name implies, it puts the spotlight on destinations that clients may be interested to visit. They are displayed in different ways. The most attractive ones are in Hot Designation module. Long-awaited time of the holiday season has arrived. We know, all travel agencies are very busy now. Their phones are red-hot! The Last Minute offers are in Hot Scroller module. 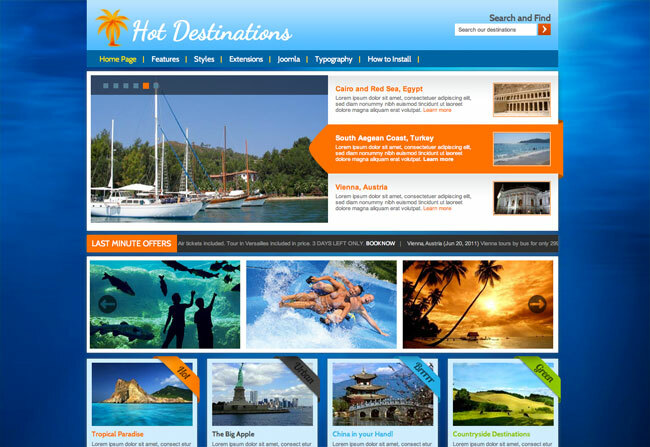 Beside several custom modules with interesting locations and lists of the places to visit, the template also includes Hot Maps module that shows Google maps of selected location. Three commercial modules (value $45) are included in template price! As you can see, you can include some interesting photos as slideshow in background. This template has been updated on April 2015. The latest version is responsive and mobile friendly. The responsive version is available for Joomla 3.x and above only. 100% responsive HTML5/CSS3 code. Valid HTML5 template code. Animated background images (slide show in background), static background image or solid background color. Colors are easily customizable in parameters. Infinite color combination. Hot Designation module (value $15), Hot Scroller module (value $15) and Hot Maps module (value $15) included in the template package free of charge! 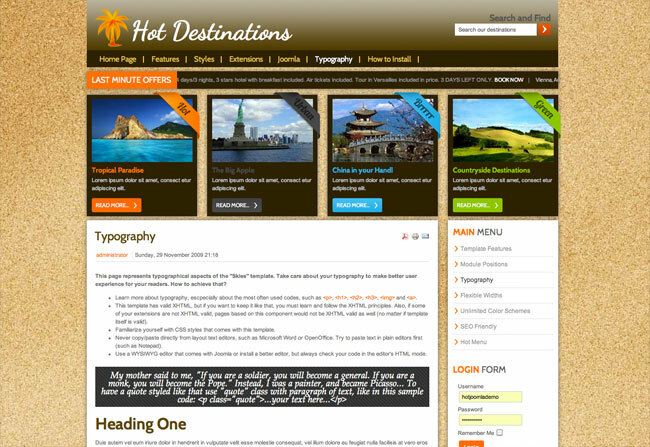 Free Hot Joomla Gallery and Hot Joomla Carousel modules included in the template package. Hot Menu (drop-down) with selection of 9 animation effects. 35 fully collapsible module positions. Google Fonts API, Reflection, Top Panel and Back on Top scripts included. Compatible with IE7+, Firefox, Chrome, Safari, Opera on both Windows and Mac. Tested with iOS and Android mobile devices.